The Landwind X7 is scheduled to go into production this month and is expected to retail for the equivalent of about 17,700 euros in China. LONDON -- Land Rover plans to complain to Chinese officials about a close copy of its Range Rover Evoque SUV that debuted at the Guangzhou auto show in China last week. "Jaguar Land Rover will take whatever steps are appropriate," the company said in a statement to Automotive News Europe. The X7 SUV, presented by Chinese automaker Landwind, closely resembles the Evoque, right down to the font and the positioning of the lettering on its hood. "The fact that this kind of copying is ongoing in China is very disappointing," Land Rover CEO Ralf Speth told the UK's Autocar magazine. "I will talk to our officials and I will talk to our partners at Chery to find a way around this situation." At the same show Land Rover revealed the first Evoques made at its new manufacturing plant in Changshu, northeast of Shanghai, built with its joint venture partner, Chery Automobile. Autocar said the Landwind X7 is scheduled to enter production this month and is expected to retail for 134,992 yuan (17,665 euros, $22,000) in China. That is significantly below the 578,000 yuan (76,000 euro) starting price of the Evoque there, which is more than the SUV's UK starting price because of import duties. 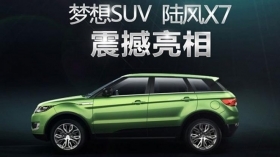 Autocar reported that the locally built Evoque, called the Aurora in China, will start at about 385,000 yuan. Landwind is an SUV-focused brand owned by Jiangling Motor Holding (JMH), the parent company of Jiangling Motor Co. (JMC). Ford has a 31 percent stake in JMC, which makes Ford Transit vans in China among other ventures. 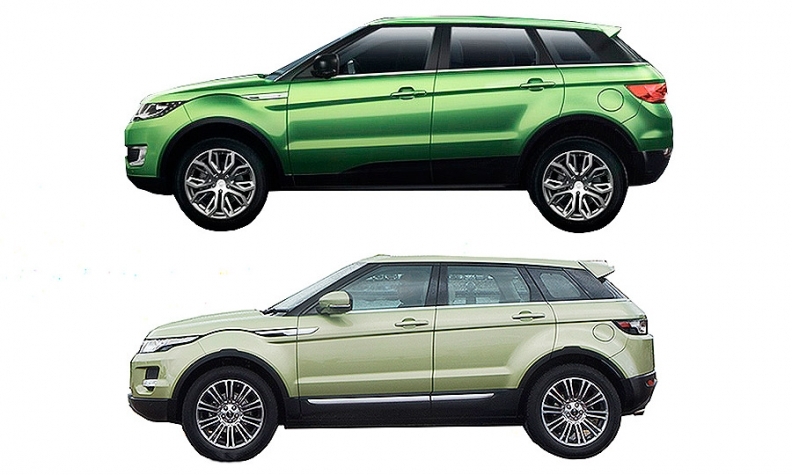 The Landwind X7, top, has borrowed virtually every exterior styling cue from the Range Rover Evoque. Chinese media earlier this year reported that Landwind had submitted patent drawings for the X7’s design with the Chinese patent office. Speth told Autocar: "The simple principle is that it is not something that should happen; the intellectual property is owned by Jaguar Land Rover, and if you break that IP then you are in breach of international regulations that apply around the world." The X7 name will be shared with a forthcoming BMW SUV and joins the X5 and X6 in Landwind’s lineup. BMW said it is powerless to prevent the name clash. “Chinese law doesn't allow companies to protect a combination of letters and numbers, such as X7, X1, 320i etc, it only works with brand and common names such as BMW, Mini, Clubman, Phantom,” a spokesperson told Automotive News Europe. High-profile disputes between Chinese automakers accused of copying design and engineering from Western cars include the 2008 case when General Motors claimed that its Daewoo Matiz subcompact was copied by Chinese automaker Chery, which marketed a very similar-looking car called the Chery QQ. The QQ was an extreme example of the sporadic industrial copying that took place in the automotive market, as its doors and a number of other parts were actually interchangeable with the Matiz. Also in 2008, an Italian court prohibited Chinese automaker Great Wall Motors from importing its Peri subcompact car, ruling it looked too much like the Fiat Panda.